Do you find yourself repeating what you say to your clients in email over and over? In small business you end up doing many tasks repetitively and then struggle to find time to focus on the things that make your business profitable. You can feel like you are in a sinking sandpit of emails and as much as you dig your way out, more sand just keeps caving in. Yet there is a lot you can do to improve the way you work, if you know how. Over the next several weeks, we will be focusing on discussing things you can do to improve and systemise the way you work. We have a saying “AOOOAJ” which means “Automate Ourself Out Of A Job”. That is, there are many tasks in your day that are simply repetition, and if it can be repeated then it can be automated. Technology, and a few simple tools, can take you a long way towards achieving this goal. Let’s face it, email is very time-consuming. We often spend many hours of our day responding to clients with the same things over and over. If you find yourself repeating products and fees, business processes, terms or frequently asked questions, then it is time to start thinking about “canned responses”. While most people cringe at the idea, canned responses are principally very practical and applicable, and one of the first foundational steps to automation. Not only will it help you dig your way out of the email sandpit, but as your business grows you’ll be able to hand over this body of knowledge and tasks to a junior and have them complete the task with very little knowledge, and you are assured of a consistent standard in your communications. There are two ways to approach it, a “whole email” template for a specific topic or a “modular sentence/paragraph” template. The “whole email” template method works when there is a common body of knowledge required. For example, when someone buys a specific product, you could send them an email that details everything they need to know about the product. The “modular sentence/paragraph” approach works when you have emails that need to be adaptive but still systemised. That is, instead of writing a whole email you save canned responses for sentences or paragraphs of text to particular questions. 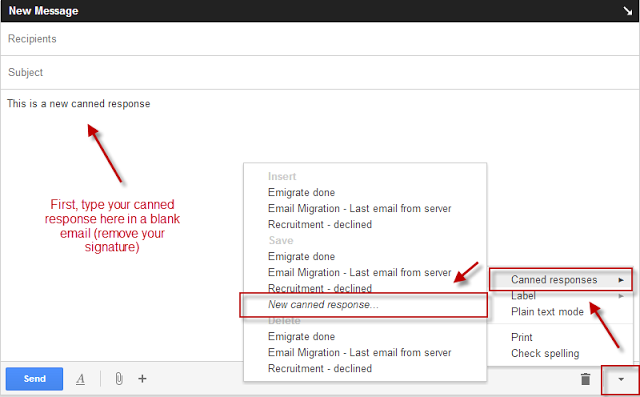 In Gmail, very few people know that you can enable canned responses in about 20 seconds. Go into your settings (cog icon at the top right) –> Labs –> Canned Responses –> and Enable it. You will then find a new option when you compose a new email. To create your canned response, start a new blank email, write what you need, and then save the canned response. You can then insert your canned response from the same menu. 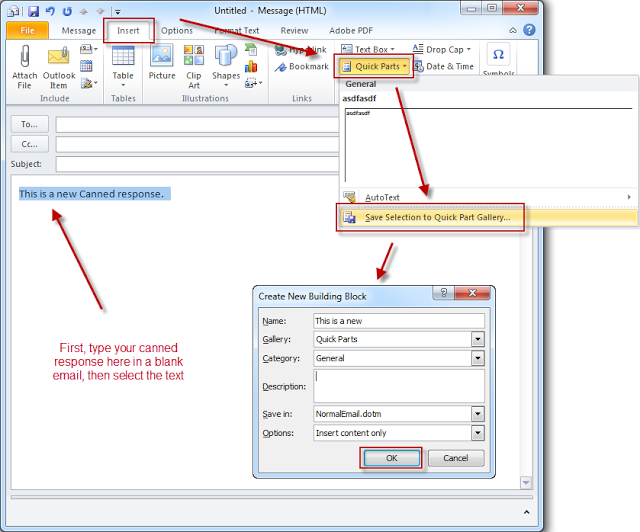 In Outlook, it is equally simple, and they are aptly called “Quick Parts”. Create a new email, write your canned response, select the text and then go Insert –> Quick Parts –> Save Select to Quick Park Gallery. You can then use them from the same menu. Building efficiency however requires that you dedicate time every day to improving something. Things will only get better if you take some time to step back, and streamline it. Canned responses are a good place to start because you are already writing the text in your email to your client, so why not convert it to a canned response and then use it again later. GongOnline are your local small business web design specialists, and they can advise you on the best ways to streamline your communications. Contact GongOnline on 800 33 441 to discuss your online marketing and communication needs.